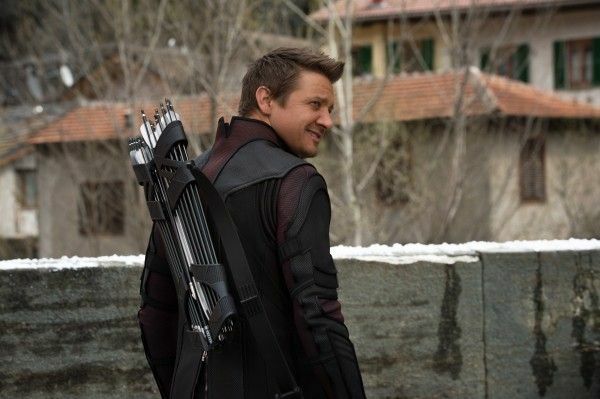 Hawkeye (Jeremy Renner), by his own admission, seemed out of his depth in Avengers: Age of Ultron. “The city is flying … we’re fighting an army of robots … and I have a bow and arrow,” he says. “None of this makes sense.” After getting locked up for fighting alongside Captain America in Captain America: Civil War, life isn’t going to get any easier for Clint Barton in Avengers: Infinity War as he and his fellow superheroes take on Thanos (Josh Brolin), who is bent on gathering the Infinity Stones and reshaping reality. JOE RUSSO: Coming out of Civil War, he’s in the same position that Cap and Falcon are at the end of that movie. And Ant-Man. And coming into this movie you know … the characters on Cap’s side coming out of the Civil War, some made certain decisions and others made other decisions that led to different paths in them dealing with oversight in this movie in a different way. So Hawkeye’s on his own journey in this movie. ANTHONY RUSSO: Yeah. He has a unique reaction to the civil war situation that puts him in a special spot in this film. Hawkeye is a fun character that the movies haven’t quite cracked yet. On the one hand, he has some of the most limited powers of any superhero, but his everyman status (or as everyman as you can get being a soldier with perfect aim) makes him a welcome addition, especially with Renner’s wisecracking personality. It will be interesting to see where Hawkeye’s journey takes him and how the film finds time for him when there are more colorful characters who also need screentime. My big hope is that they don’t kill him off because I think a Hawkeye series based on Matt Fraction comics is the great Marvel TV series we haven’t seen yet. Pizza Dog would be ratings gold. Avengers: Infinity War opens April 27th and also stars Robert Downey Jr., Chris Hemsworth, Chris Evans, Scarlett Johansson, Chadwick Boseman, Paul Bettany, Benedict Cumberbatch, Tom Holland, Mark Ruffalo, Samuel L. Jackson, Chris Pratt, Zoe Saldana, Dave Bautista, Bradley Cooper, Vin Diesel, Don Cheadle, Anthony Mackie, Sebastian Stan, Elizabeth Olsen, Tom Holland, Paul Rudd, and Tom Hiddleston.